The expression in Mallorca is la pedra estira. Translated, ‘the rocks pulls you’ refers to the number of Mallorcans who leave the island and, no matter how far they go, they return to Mallorca eventually. His family finca where he now lives and works has changed little in four generations. Decorated with decidedly unfashionable heavy wooden furniture and typical family knick-knacks, this house is certainly less a showcase for Pons, and more a symbolic return to his creative and ancestral roots. He has set up an atelier here, in the very same room where he spent his childhood afternoons cutting Borda magazine patterns of Jackie O-inspired suits with his mother and aunt. His childhood by his own account was idyllic. He comes from a close-knit agrarian Mallorcan family who instilled in him the importance of being grounded in a place, and staying connected to the earth. As a teenager he knew he wanted to be a clothing designer. In 1991 Pons won a scholarship to attend Central Saint Martin’s prestigious fashion program in England. Without speaking a word of English, he arrived in central London and was immersed in a rigorous Master’s course with fellow fashion students that included Stella McCartney, Matthew Williamson, and Alexander McQueen. 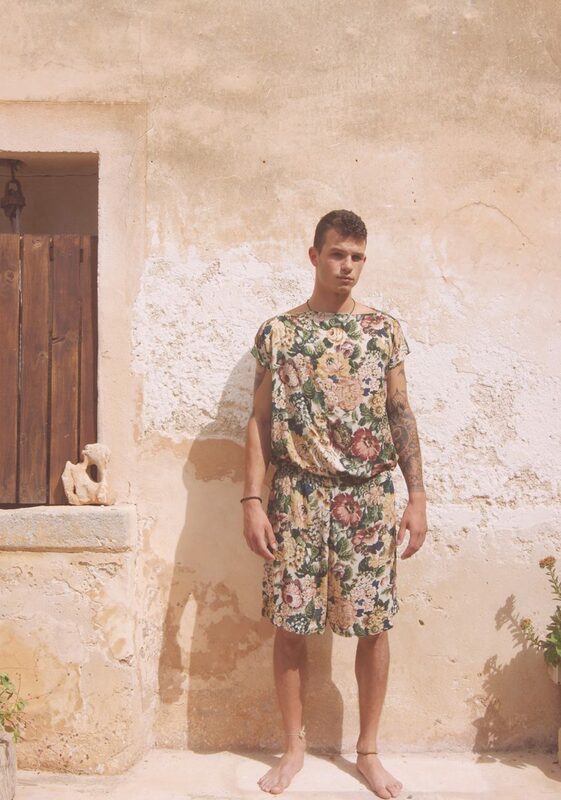 As he became more urban, his creative expression began to reference back to Mallorca. “When I had no money for art supplies, I painted with ash and clay, my professor loved it and bought every painting,” Sebastián recalls. Pons began to work with ‘Lee’ (as his friends called him) Alexander McQueen printing fabrics in the school’s print shop for the designer’s ready-to-wear collections. When McQueen was asked to become head designer at Givenchy, replacing John Galliano, he asked Pons to go with him. “Lee said to me, you understand how I work and how I am emotionally, and I want you to come to Paris to be my assistant.” And it was a historic moment in fashion: “He changed fashion forever,” Pons says. Pons left McQueen in 2000, moving to New York, where he designed several critically acclaimed collections under his own Sebastián Pons label. Returning to Spain for inspiration every season, his collections included flamenco minis and Inquisition altar boy bloomers. Vogue reviewed his collections, applauding his work and called him a “designer to watch”. In 2009, he returned back to his family home after his father died. The following year, Alexander McQueen committed suicide at the peak of his career due to depression and unsubstantiated rumours of HIV and drug use. It shocked the whole of the fashion world. Pons was heartbroken, and it appears to have been a turning point for him. He returned to Mallorca and withdrew from fashion for several years. It took three years to convince him, but Pons eventually collaborated with the directors Peter Ettedgui and Ian Bonhôte on the documentary McQueen, released this summer to rave reviews. Meanwhile, Pons has been busy at work in his studio on a new project, Muchache – a gender neutralisation of the Spanish word muchacho/a meaning young girl or boy. It slants at the newfound fluidity of gender identity and sexuality in fashion; all of his pieces are one size fits all. 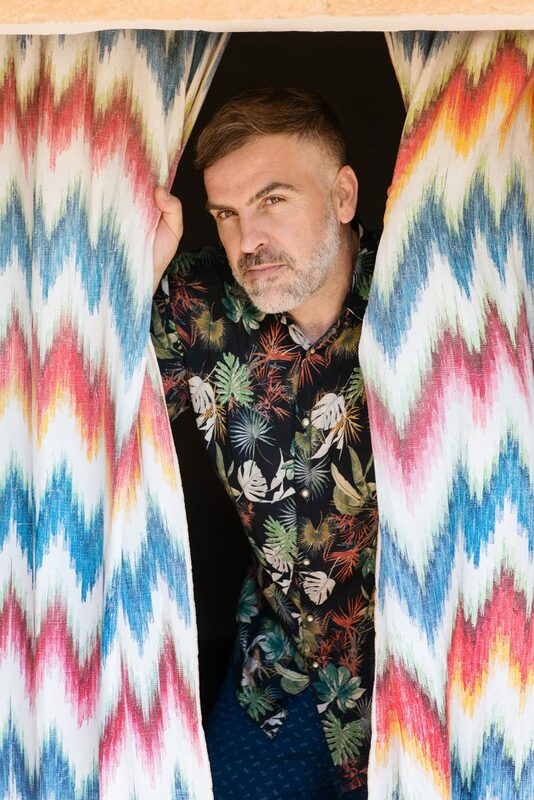 Muchache is Pons’ return to his craft after a hiatus, a retrospective of textiles and patterns he has designed and collected over nearly 30 years in the fashion business. He has brought back favourite silhouettes of his own design, and had his textiles printed on the island. He doesn’t sell online, nor does he intend to. He wants to bring a feeling back to clothes. 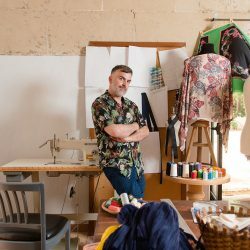 “We have closets full of clothes, and we have no connection to them, Muchache for me is something different.” The Muchache collection’s bright patterned tunics and asymmetric cut draped dresses use 0km ethical practices; everything is made on Mallorca, by hand, and his mother and aunt are sewing with him once again.